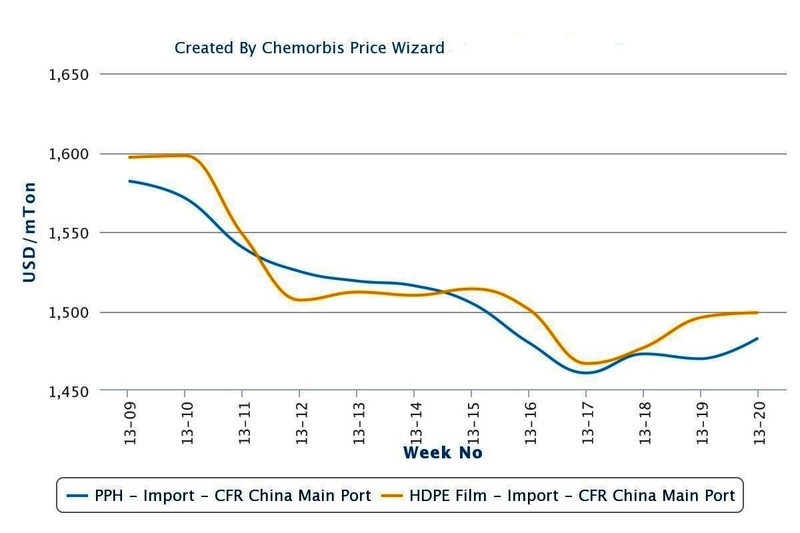 Players in India and Southeast Asia reported rising local prices over the past week as healthy demand in several of the region’s countries and stronger global sentiment helped push prices upward as per the pricing service of ChemOrbis. Firm energy costs have also contributed to the rising trend in the region’s local markets. According to a distributor in India, a domestic producer raised their local prices by INR2000/ton ($37/ton) for HDPE, INR3000/ton ($56/ton) for LLDPE and by INR4000/ton ($74/ton) for LDPE effective as of May 16. “The depreciation in the Indian rupee combined with the recent decision to raise customs duties on polymer imports from 5% to 7.5% has persuaded many buyers to shift more of their purchasing to the local market. We are enjoying healthy sales now as many buyers had not restocked much during April and we expect to see healthy demand and rising prices in June,” a source at an Indian producer commented. Players in Thailand report that domestic PE prices were stable to THB500-1000/ton ($17-34/ton) firmer over the past week, with demand said to be gradually improving even though many buyers are still proceeding cautiously in their purchases. “Prices moved higher this week and demand is getting a bit better. Our stock levels are low and we will consider purchasing some material next week if demand continues to improve,” a distributor based in Bangkok reported. Elsewhere, buyers in Indonesia said that they are securing material now in anticipation of firmer prices while a domestic producer reported lifting their offers. A converter producing grocery bags commented, “We recently secured some material and would purchase some additional cargoes if it were not for our cash flow concerns. Demand for our end products is not great just now, but we believe that buying interest will pick up and that supply might begin to tighten as Ramadan approaches.” A source at a domestic producer said, “We raised our prices for both HDPE and LLDPE film by $20/ton. 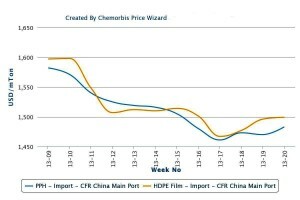 According to ChemOrbis, players in the Philippines also reported seeing higher locally-held PE prices on the week. A plastic bag converter commented, “Demand has improved relative to the past month although it remains disappointing relative to the past year. We plan to purchase some HDPE soon as our stocks for this product are limited but we are in no rush to purchase other PE products. A converter manufacturing plastic sheets said, “Demand is not great now but we think that buying interest will pick up in June or July.